Whatever your moving needs may be, Meathead Movers will help you feel at home in Ridgecrest. Our professionally trained student-athlete movers and our moving concierge will be with you for the entirety of your move to Ridgecrest. If you are moving to or from anywhere in Ridgecrest, we are the moving company for you! Our professionally trained student-athlete movers and our moving concierge service are here to help you with every stage of your move. Located in the southern part of Indian Wells Valley and in northeast Kern County, Ridgecrest is a friendly and dynamic town that you will love calling home! Surrounded by four mountain ranges, the Sierra Nevada, the Cosos, the Argus Range, and the El Paso Mountains, you will be sure to enjoy the scenery of the area. Not only will you enjoy beautiful environment, but the town also has a thriving economy and serves as a shopping and business hub in Kern County. After your move, you can explore Little Petroglyph Canyon within the vast Maturango Museum or take in the museum at the China Lake Naval Weapons Center. 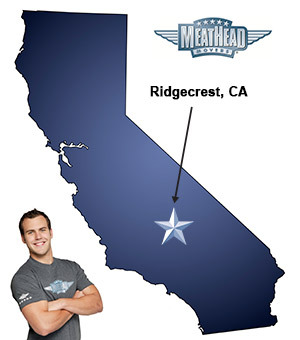 If you are considering a move to Ridgecrest, Meathead Movers is here to help. Our moving company specializes in local, long-distance, and commercial moves to, from, and within Ridgecrest. We also provide reliable packing, storage, on-site relocations, and our distinctive moving concierge service, which connects you with local service providers. In fact, you can see what your neighbors have to say about us. With our 100% satisfaction guarantee and A+ rating with the Better Business Bureau, the only thing you have to lose is the stress that comes from moving! Contact us today for a free no-obligation moving quote and to learn how we can help you on your next move! Moving to Ridgecrest? Here are some helpful resources. “Everyone involved was super friendly and knowledgeable. There were no surprises. The moving guys called to say what time they would arrive and they texted a picture beforehand so I knew who to expect. They arrived on time and were careful of my things. Same guys delivered the next day and it couldn’t gone better. Great job Meathead Movers!!! If I have to move ever again, (but I hope not) I would definitely call you again. Everyone was so helpful and kind!! Great service and excellent movers. The overall high quality of every aspect of your service.